Take our Hunt Test Survey! Is proud to invite you to attend our HRC SPRING DOUBLE HEADER, and HOTSHOT COMPETITION. Get your dog and family ready for a fantastic weekend of fun and great dog work! Bring your wife and daughters! Fun for the whole family! FOR YOUR CONVENIENCE WE HAVE POSTED THE CURRENT WEATHER FOR THE REGION. CLICK ON THE LINK TO SEE THE 10 DAY FORECAST. PHOTOS: We are planning a very nice catalog. If you would like a photo of your dog to appear in the printed catalog and the online catalog please include with your entry a non copyright photo of your dog. Clearly label it on the back with your name and the dogs name. Photos will be returned at check in. PAHRC is not responsible for lost or damaged photos. PAHRC reserves the right to not use any photo it deems unsuitable for its purposes for any reason. CLOSING: Advanced entries will close April 28, 2001 (you may enter on the day of the hunt provided the stake you are entering has not reached its cut off limit. Entries will close on the 50th entry received in Started. Entries will close on the 40th entry received in Seasoned. Entries will close on the 30th entry received in Finished per Flight. Entries limited to 8 dogs per Handler. You must fill out one entry PER DOG / PER DAY. COURSES: Ducks on water and Pigeons on land in all Tests. ATTIRE: Camo and or Hunting clothes must be worn by all Handlers. Spectators are requested to wear the same or dark clothing. No one will be allowed the Gallery wearing light / or brightly colored clothing. 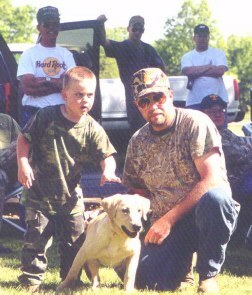 **Seasoned & Finished Handlers need Hip Boots or Waders. ** Water will be ran in a flooded Tupelo Tree swamp. Bring Waders! Will be held Saturday May 5th. 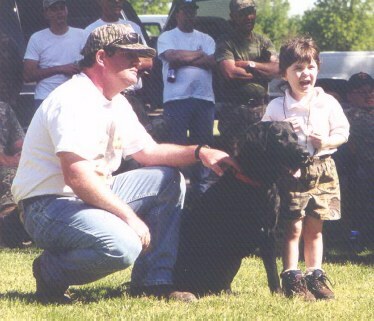 Your dog need not be entered in the regular Hunt to participate. Everyone entering excluding the First and Second place winners will be included in a drawing to win $50.00. Think your dog is fast? Let's find out. The Hot Shot is easy, fun and simple. 1. A circle is painted on the ground. 2. You and your dog stand in the middle. 3. You signal the time keepers that you are ready. A remote dummy launcher is fired. The dog does not have to be steady. You can even send the dog while the bumper is still in the air. 4. Timers start as soon as the dog breaks the painted line of the circle. Timers stop as soon as the dog crosses the painted line of the circle with the bumper. The dog does not have to deliver the bumper to hand. LUNCH: Will be available on the grounds. 1 1/2" Pork Chops and all the trimmings provided by "WALDON's LODGE"
$5.00 per person. You must RSVP by May 1st. Click HERE To Print Ticket Request Form. A special Raffle will be held at the Banquet for an Original Oil Portrait of YOUR DOG. In addition Mr. Ward is offering a special price of $450.00 to anyone who commissions a portrait at the Hunt. A sample of Mr. Ward's work will be on display at the Hunt Test HQ. A 12 Gauge Pump Shotgun will be raffled as well. "Dedicated to Retrievers and Their Owners"
We have fun activities planned for your children such as: Kid Trials, Dummy Toss, etc.